Part 10 of the Gingerbread Village. 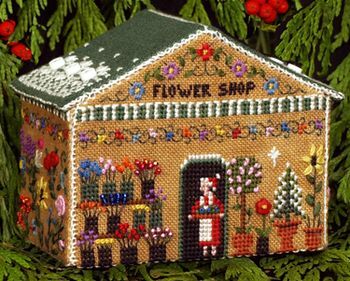 You will need a 14" x 17" piece of 28ct Gingerbread Cashel linen by Picture This Plus, and for the roof, a 12" x 8" piece of 28ct Herald linen by Picture This Plus. Leaflet contains complete stitching and finishing instructions. Accessory Pack 201P containing silk flosses and embellishments is available from House of Stitches.